The QEII Bridge, which links the M25 between Essex and Kent, has reopened after gale-force winds closed it for the second time this week. It was shut at 22:00 GMT on Wednesday, leading to delays for motorists as traffic queues built up on both sides of the Dartford Crossing on Thursday. Clockwise traffic used the east bore of the Dartford Tunnel with anti-clockwise traffic diverted to the west bore. Delays were still being reported for drivers on Thursday evening. Earlier, ferry services from Dover were also delayed because of rough seas. The Port of Dover said all P&O services to Calais and DFDS ferries to Dunkirk were affected, with passengers being advised to contact the operators for further information. Southern and Southeastern railways both said a number of services in Kent had been disrupted because of trees and obstructions on the line. 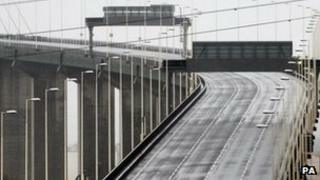 On Tuesday, the QEII Bridge was also closed for several hours because of high winds, which caused widespread disruption across south-east England. Van driver Christopher Hayes, 51, died as a beech tree fell on his cab in high winds in Tunbridge Wells.